SEO Blog Sydney brings the latest news from the search engine optimisation (SEO) industry in Sydney, Australia. SEO Sydney also provides information on SEO Jobs in Australia, SEO Training. SEO Sydney Blog also offers cutting edge SEO Services and tips on how to improve your rankings in Search Engines. With the strong increase in popularity of social networking tools an it becomes more and more important to consider these channels in any online strategy. 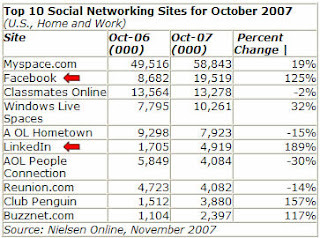 Nielsen Online published in November 2007 the top 10 rankings for social media websites. Even if the study has a focus on the US market, it still help to have a better understanding on which services are more popular and therefore where to focus your efforts. Even if Facebook has gathered most of the attention, MySpace is still largely dominating the market in terms of members. Facebook has however recorded a huge 125% growth compared to last year. The largest growth (189%) has been recorded by Linkedin, the professional networking tool. Although useful, the Nielsen study does not identify the level of activity of the members, which could reveal another dimension and would probably change the current ranking. Highly involved members, who communicate inside and outside of the network,bring more value. Looking at reputation management and online presence, Social Media Networks will have a more and more considerable impact in the next year and should therefore be considered.